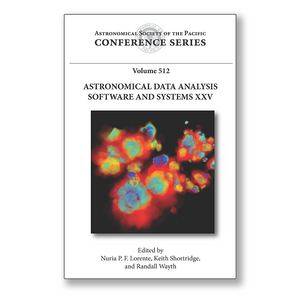 Editor(s): Lorente, N. P. F.; Shortridge, K.; Wayth, R.
This volume contains papers presented at the twenty-fifth annual conference on Astronomical Data Analysis Software and Systems (ADASS XXV). The ADASS conference is the premier conference for the exchange of information about astronomical software, and it is held each year at a different hosting astronomical institution. The conference provides a forum for astronomers, software engineers, and data specialists from around the world to discuss software and algorithms as used in all aspects of astronomy, from telescope operations, to data reduction, to outreach and education. The key themes for ADASS XXV included knowledge discovery and data management tools for astronomical “Big Data”; LSST and lessons learned from current programs; algorithms for astronomical data reduction; real-time processing; visualization and innovative user interfaces; and data pipelines. These and a wide range of additional topics were addressed in a program that included nearly sixty talks, over a hundred and twenty posters, four focus demonstrations, five “Birds of a Feather” sessions, eleven demo booths, and one tutorial. These proceedings will be of interest to a wide audience of scientists and engineers with an interest in developing and managing complex software systems and large data volumes.